There is a tremendous demand for highly Na+-selective fluoroionophores to monitor the top analyte Na+ in life science. Here, we report a systematic route to develop highly Na+/K+ selective fluorescent probes. Thus, we synthesized a set of fluoroionophores 1, 3, 4, 5, 8 and 9 (see Scheme 1) to investigate the Na+/K+ selectivity and Na+- complex stability in CH3CN and H2O. These Na+-probes bear different 15-crown-5 moieties to bind Na+ stronger than K+. 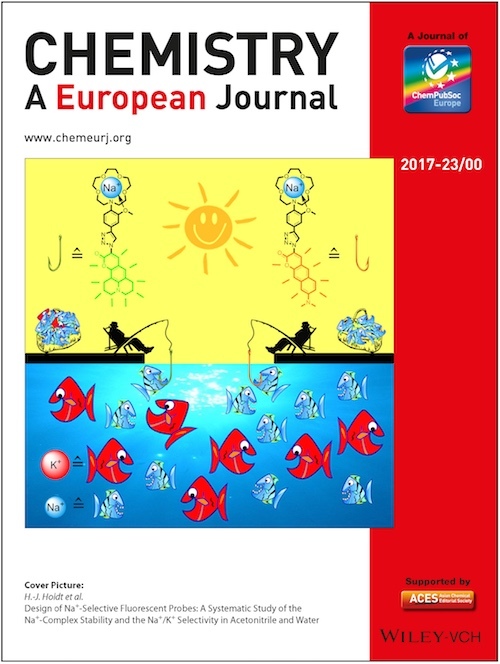 In the set of the diethylaminocoumarin-substituted fluoroionophores 1–5, the following trend of fluorescence quenching 1>3>2>4>5 in CH3CN was observed. Therefore, the flexibility of the aza-15-crown-5 moieties in 1–4 determines the conjugation of the nitrogen lone pair with the aromatic ring. As a consequence, 1 showed in CH3CN the highest Na+-induced fluorescence enhancement (FE) by a factor of 46.5 and a weaker K+ induced FE of 3.7. The Na+-complex stability of 1–4 in CH3CN is enhanced in the following order of 2>4>3>1, assuming that the O-atom of the methoxy group in the ortho-position, as shown in 2, strengthened the Na+-complex formation. Furthermore, we found for the N-(o-methoxyphenyl)aza-15-crown-5 substituted fluoroionophores 2, 8 and 9 in H2O, an enhanced Na+-complex stability in the following order 8>2>9 and an increased Na+/K+ selectivity in the reverse order 9>2>8. Notably, the Na+-induced FE of 8 (FEF=10.9), 2 (FEF=5.0) and 9 (FEF=2.0) showed a similar trend associated with a decreased K+-induced FE [8 (FEF=2.7)>2 (FEF=1.5)>9 (FEF=1.1)]. Here, the Na+-complex stability and Na+/K+ selectivity is also influenced by the fluorophore moiety. Thus, fluorescent probe 8 (Kd=48 mm) allows high-contrast, sensitive, and selective Na+ measurements over extracellular K+ levels. A higher Na+/K+ selectivity showed fluorescent probe 9, but also a higher Kd value of 223 mm. Therefore, 9 is a suitable tool to measure Na+ concentrations up to 300 mm at a fluorescence emission of 614 nm.